The officer involved shooting (OIS) that occurred in Ferguson, Missouri on August 9th has set off another coast-to-coast media frenzy. We have all grown used to this over the years. It is even expected. The reporters and the pundits and the politicians can seemingly never get enough. I liken it in many respects to throwing raw meat to a pack of starving dogs. After every supposition, every rumor and innuendo, every “eyewitness account” and amateur video has been played, played, and replayed ad nauseam, then the media hounds turn and circle back elsewhere and drudge up old buried bones. It did not take long before it happened here with the comparison of the Ferguson case with the San Francisco PD Bernal Heights incident. Again, no one was surprised. Our support for the beleaguered officer in Ferguson must be unwavering, especially now before the story is really known. On Page One of the August POA Journal, I wrote frankly about the obvious: shooting anyone is the last thing any officer ever wants to do. I know first-hand the grief, trauma, disruption, accusations, and strife that OIS incidents thrust upon an otherwise private and modest life. It is the worst aspect of this profession. I have no doubt that the officers in Ferguson feel the same way. None of us were present in Ferguson on August 9th. We don’t know the true facts of the incident. Few people do, even in Ferguson. So, it is perplexing to me how so called “community activists or leaders” and some irresponsible politicians have publicly proclaimed the truth of this case, drawn their own biased conclusions. We expect that from the family, but it is shameful when it comes from elected officials. Talk about a rush to judgment! It is all an opportunistic rush to judgment, driven in large part by “social media.” It is baffling how so many “tweets” are instantaneously assumed to be true. It becomes a runaway train of rumor and innuendo, and it does little good to either side of the argument. Twitter, Instagram, Facebook, and the myriad of social media outlets that empower anyone with two opposable thumbs and a smart phone to offer their two cents no matter how ridiculous it may be. The real danger rests in those that read and believe this nonsense – especially when those are trained media professionals. Make no mistake about it. Right now, the Ferguson story is entirely media driven. It is not fact-based, and it is very anti-police. We have not heard the officer’s side, or the facts of the investigation. So, for now, it’s a one-sided tale, and likely will be for a while. The people of Ferguson, of Missouri, and of the United States must let this case make it’s way through the system to a factual conclusion. This will not happen over night, and it absolutely should not happen on CNN or MSNBC, on Twitter or Facebook. But eventually, the inevitable comparison between the OIS in Ferguson and the OIS on Bernal Heights will be made in the local media or by some aspiring politician. But, in truth, the two events are not directly comparable. They are an apple and an orange. 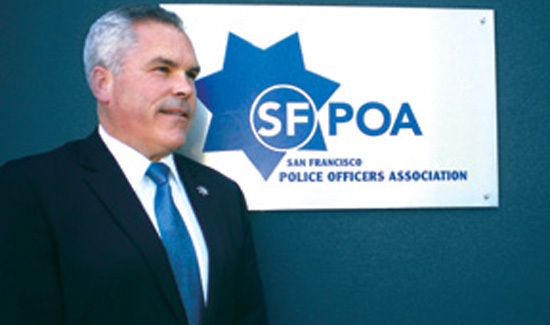 The San Francisco PD and, by association, the POA have a different approach in dealing with sensitive officer involved shootings. For many years now there has been outreach to community groups, religious leaders, and elected representatives both on the Command Staff level, the district station level, and through the POA. Although there may be controversy immediately following an OIS, the department gets on top of and in front of the issue quickly. The department and the POA have built bridges and invested in our community. Trust and common ground have long been established. Our partnerships with the people of this city pay off when tensions run high. Since the incident in Ferguson, the OIS at Bernal Heights Park from March of this year has been brought forth in the media again. While I do know some of the details of this incident since I responded as the President of the POA, and I do know these officers, I once again do not know everything about it simply because the multiple investigations that were launched from the SFPD, The District Attorney’s Office, the Office of Citizens Complaints, etc. have not been concluded. But yet Oakland attorney John Burris, who was not there that evening, has made a statement in an August 23rd article in SF Gate. “We believe that did not happen, and we believe that it did not happen the way the officers claimed it did.” What is Mr. Burris basing his beliefs upon? It certainly is not anyone of the official investigations. More than likely, he is basing it on one side of the story – that of the would-be plaintiffs. In Ferguson, such comments spurred riots. In San Francisco, it was a march. This is how we handled it. Last Friday, there was a march from Bernal Heights Park to the Federal building. The friends and family of the individual who died in the incident at the park organized this march. Enter the new commanding officer of Ingleside Station, Joe McFadden. Captain McFadden, having years of experience dealing with community groups as the OIS Coordinator, during past administrations, spoke with the organizers of the march prior to the event. Before the first step was taken, a dialogue was established and mutual cooperation achieved. Although there was a large crowd and there were many police personnel and resources available to Joe. He was able to effectively deploy the officers without causing any friction with the marchers, and he ensured that their constitutional right of assembly and free speech was honored while he maintained public safety. This led to a peaceful march, with no vandalism, zero arrests, and only minor traffic congestion. I realize the demographics, the politics, and perception of police officers is drastically different between San Francisco and Ferguson. But I also believe that the men and women of the Ferguson Police Department entered into this noble profession for the very same reasons that most law enforcement officers enter in this line of work. They are doing their job and serving their community. For us, it is more a case of “Been there, done that.” We do not necessarily do things better than they did, only that we do it differently, and the difference, it seems, is derived from sheer, hard-earned, bitter experience. Of course, it doesn’t hurt that we also have competent and equally experienced front-line leadership.